Mysuru: Sandhya Suraksha Trust and District Brahmana Mahasabha had organised a function at Sarada Vilas College Centenary Hall in Krishnamurthypuram here on Saturday to felicitate dignitaries and present Pratibha Puraskar to meritorious students. Inaugurating the programme, District in-Charge Minister G.T. Devegowda lauded Chief Minister H.D. Kumaraswamy (HDK) in establishing Brahmins Development Corporation and sanctioning an initial fund of Rs.25 crore. He appreciated the Brahmin Community in spreading the message that education was the basic necessity in development. Speaking on the occasion, State JD(S) President A.H. Vishwanath regretted that of late, a lot of criticism have been levelled against the Brahmin Community. At the beginning of the programme, floral tributes were paid to a portrait of former Prime Minister late Atal Bihari Vajpayee. 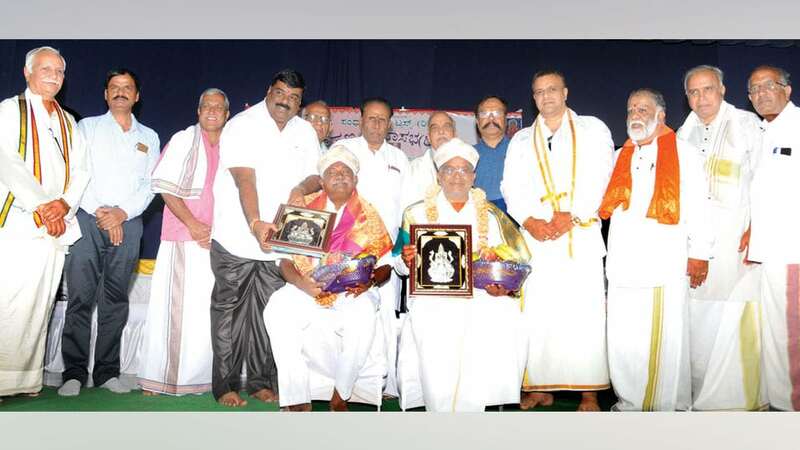 Devegowda and Vishwanath were felicitated on the occasion. Pratibha Puraskar was presented to students who had excelled in SSLC and PU examinations. Akhila Karnataka Brahmana Mahasabha District President Nataraj Jois, Vice-President B.V. Manjunath, Journalist Amshi Prasannakumar, Entrepreneur G. Ravi and others were present.